Individuals needing to renew expiring standard, emergency or childcare first aid certificates can attend re-certification courses with Winnipeg First Aid. Stand-alone CPR level’s “C” and “HCP” are also available for renewal. This workplace approved provider teaches the latest American Heart Association and ILCOR standards with the latest training mannequins and equipment. Typical participants include teachers, nurses, security officers, fitness instructors, life guards, dentists, dental hygienists, chiropractors, fitness trainers, airline employees, EMS, first responders, oil workers, construction workers, fire fighters, military officers and police officers. Keep your certificate current and learn the latest standards by enrolling in a re-cert course. To register for a first aid and / or CPR re-certification course in Winnipeg, Manitoba use the information provided below or click the link. Sign up for a re-certification training class with Winnipeg First Aid here today! Prospective trainees can register for a course using the form above, or via e-mail, telephone call, or walk-in during business hours in any of the training centers in Winnipeg. The main training facility in located near down-town Winnipeg in the Osborne area. Plenty of parking is available neraby. Students also have easy and convenient access to public transit and restuarants. View the map below for more information on the facility. Once a trainee completes the enrolled course, a certificate from St Mark James is awarded to him or her. The certificate comes in wall-mount and wallet size awards. The wallet sized award is the only workplace approved award. Valid for three years, the certificate is renewable through refresher programs held several times per week at Winnipeg First Aid. Assisting a person who is conscious and choking. Training programs encompass a variety of different skills such as chest compressions, rescue breaths, AED use, burn and wound management, and many more. Classes are spent perfecting these skills on the latest training equipment. Winnipeg First Aid also offers students, big groups of trainees, and companies seeking training private classes. You can inquire about private classes using the contact information above. Stand-alone classes for CPR and first aid are also available to trainees who do not want to enrol in the full training course. 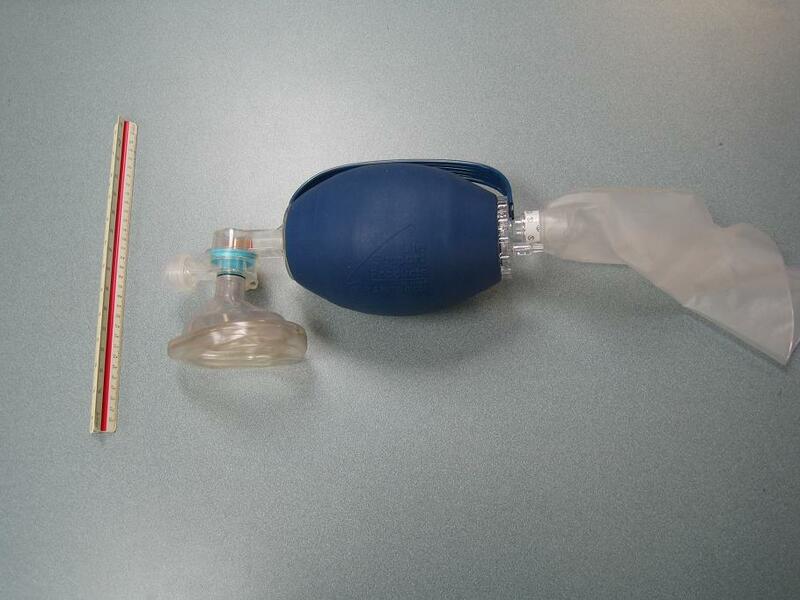 Adult bag valve mask used in an HCP level program. Winnipeg First Aid offers the most reasonable costs through the Winnipeg region. Trainees will not find better rates in the area. The rates include taxes, certification fees, and training manuals so trainees don’t have additional expenses to worry about. Classes cost from 48 dollars to 115 dollars, depending on the training program level. Check out the latest standards in cardiopulmonary resuscitation in the video below. Register for a first aid and CPR course in Winnipeg Today!